UNITED NATIONS, January 6, updated Jan. 7 -- As outgoing UN envoy to Afghanistan Kai Eide spoke in the Security Council Wednesday morning, Russian Ambassador Vitaly Churkin slumped next to him, non-plussed. Eide fell under fire not only for allegedly covering up President Hamid Karzai's election fraud in 2009, but also from Russia and others for being, in their view, too willing to talk with the Taliban. The self-styled Paper of Record slammed both Kai Eide and de Mistura's "low key style" and "bureaucratic instincts." The UN's response, seeming decided on at a meeting Monday morning and crystallized in talking points, was to question why the paper chimed in with an editorial at this time. As the Security Council's gabfest on Afghanistan came to an end, Inner City Press asked Ban Ki-moon what he made of the New York Times editorial. He said he had read it, but that choosing the replacement of Kai Eide is his "prerogative." But what about Hamid Karzai's veto? As to the origins of the Gray Lady's editorial, while the U.S. State Department is pushing de Mistura, there are other views in Foggy Bottom, with direct access to Times Square. The finger points at Richard Holbrooke, and as the actual author the retired op-ed writing Robert Unger. Last time, Holbrooke lobbied Ban to get Peter Galbraith appointed. Given how that worked out, the theory goes, Holbrooke couldn't lobby Ban directly, but rather had to work through the Times. But Ban has in essence shot it down. Left unanswered for a week now are questioned posed to spokesman Martin Nesirky about Ban Ki-moon's son in law Siddarth Chatterjee, hired by de Mistura in Iraq, later promoted by Jan Mattsson at UNOPS in Copenhagen, in both cases reportedly to gain favor with Mr. Ban. On January 6, Nesirky for the first time cut off questions, saying at 12:30 that Ban was about to speak at the Security Council stakeout. But up to 12:50, Ban had still not appeared. Others muse that Ban Ki-moon's call for NATO to name a civilian / humanitarian czar is a fall back position. 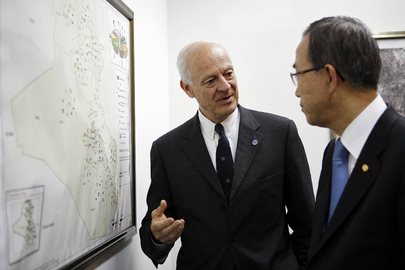 If de Mistura is vetoed by Karzai, he could go for the UN-urged NATO position. It would be nice to get more of these questions answered, but at this UN it is not happening. Watch this site. Footnote: as the Council meeting broke up Mona Jul, Norwegian Deputy Ambassador, and lambaster of Mr. Ban, waited and greeted Kai Eide. In her anti-Ban memo, the only SRSG she praised was... her paisan Kai Eide. Eide will hold a press conference at the UN on January 7. We'll be there. Please note that the press briefing that had been scheduled for 10:00 am on Thursday by the Secretary-General's Special Representative for Afghanistan, Kai Eide, has been cancelled. Mr. Eide is traveling to Washington, D.C. today and is unavailable for the briefing. UNITED NATIONS, January 1 -- With the short list for the UN's top post in Afghanistan reportedly narrowed down to three, UN sources confirm to Inner City Press that the push is on to get approval for Staffan de Mistura, currently in a virtually no-show job with the World Food Program. What many in the UN but few outside it talk about is di Mistura's previous choice of UN Secretary General Ban Ki-moon's son in law Siddarth Chatterjee as his deputy in Iraq, and the role they think this plays in de Mistura's frontrunner status. While Mr. Ban has shown discomfort and anger about any questions concerning the fast promotions his son in law has received since he became Secretary General, few explanations have been given. That UN officials like de Mistura and now Jan Mattsson of the UN Office of Project Services, where Chatterjee has been given a D-1 position that is quietly being upgraded to D-2, ingratiate themselves with UN Headquarters by promoting the Secretary General's son in law has also not been addressed. 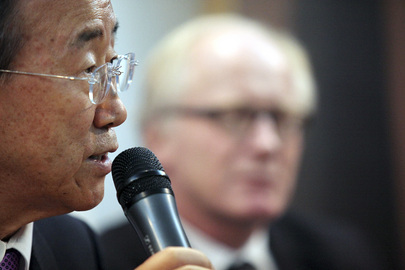 Inner City Press, which covered both of these Chatterjee promotions, the latter exclusively, was chided by Mr. Ban's previous Spokesperson Michele Montas to stop asking about Chatterjee in the UN's noon briefings, but rather to get answers from Ban's senior advisor Kim Won-soo. Chatterjee himself took to calling and making legal threats to journalists who had picked up on Inner City Press' reports on his promotions, and getting them removed from the Internet, at least from web sites hosted in his native India. It is not clear if Chatterjee made these calls during time he was being paid by UNOPS. It is clear, however, that UNOPS devoted staff time to media strategies to defend Chatterjee's promotions and Chatterjee himself, work it hard to imagine being done if he was not the UN Secretary General's son in law. In the week between Christmas and New Year, Inner City Press submitted to Mr. Ban's new Spokesman Martin Nesirky questions about Siddarth Chatterjee, including about his promotions, qualifications and fitness. While on the afternoon of Christmas Eve Mr. Nesirky's office provided at least cursory answers to other questions asked, including referring questions about possible nepotism by a Ban appointee to another spokesperson, the questions about Ban's son in law not only were not answered, they were not mentioned. But they will not go away. The responses are being sought only in fairness, explicitly on deadline. Watch this site. The other two named candidates are Jean Marie Guehenno, strangely with the backing of the New York Times, and Ian Martin, currently in an ill-defined role with the UN Department of Political Affairs. What the Times did not mention about Mr. Guehenno, in fairness, is that after he was replaced by fellow Frenchman Alain Le Roy, he was given a no show UN Under Secretary General position for "Regional Cooperation." While that post should have involved liaising between the UN and NATO, for example, or ECOWAS or even the Shanghai Cooperation Organization, months into the job Guehenno candidly admitted to Inner City Press that he had done no work at all. He was shut in writing a book. How its publication, or the timing of its publication, may be related to the current campaigning for the Kabul post is not clear. Following his candor, Guehenno clammed up. At a recent forum about illegal mining in the Congo, at which questions about the UN Peacekeeping Mission in the Congo's involvement with rogue Army units who mine and massacres, Guehenno explicitly refused to answer any questions from Inner City Press. While in the midst of his campaign for Kabul he perhaps felt he had nothing to gain, ham handed rebuffing of the press would not make Guehenno that different front Kai Eide, outgoing in only one of the word's two senses. Ironically, Guehenno is also mentioned by human rights groups as a candidate to take over from Alan Doss at the UN Mission in the Congo. Doss is himself embroiled in a nepotism scandal since Inner City Press received and published his e-mail telling the UN Development Program to bend and break UN rules and give a job to his daugther. Mr. Ban five months ago promised an investigation, but some attribute the delay to Ban's own resistance to nepotism questions. Doss may be allowed to serve out his contract then Guehenno, if still available, be given the Congo job. Ian Martin appeared to go a good job in Nepal, although it appears now to be unraveling. When Inner City Press asked him in a UN hallway about Kabul, Martin laughed. Later he clarified he was not laughing with Inner City Press, only laughing. And laughter may be one of the many things there is not enough of in Kabul. Footnote: Inner City Press is also told that the U.S., not wanting to be upstaged in Afghanistan, has joined Ban in pushing President Hamid Karzai to accept de Mistura. But Karzai, who previously vetoed the proposal to make Paddy Ashdown a "Super Envoy" to Afghanistan, is near to issuing a similar veto of di Mistura. Watch this site.